Nickel five cent pieces were first minted in 1866. The first nickel was the Shield type that portrayed the shield of the United States with the date below the shield and the words “In God We Trust” above the shield. 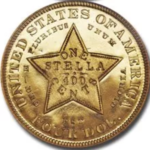 The reverse has the number “5” in the center with either stars and rays surrounding it or stars alone. 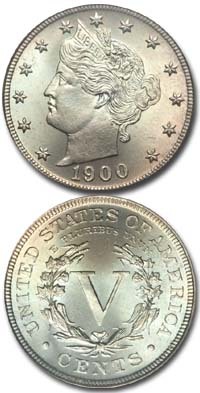 In 1883 the shield nickel was replaced by a nickel with a representation of Liberty on the dated side and a Roman numeral “5” on the reverse (See 1883 Racketeer Nickel). 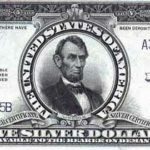 The Liberty Head nickel was made until 1912. 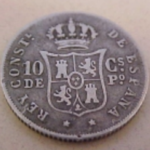 Since nickels were the most widely used coins during the late 19th and early 20th century, most examples encountered today are well worn. Shield nickels are worth about $12 in average condition, while Liberty nickels are worth only about $1 each. Mint marked examples are found in only one year, 1912. On these coins, a letter “D” or “S” is located on the reverse of the coin, under the dot to the left of the word “CENTS.” The Liberty Nickel series contains the rarest and most famous nickel of all, the 1913, of which only five examples are known. 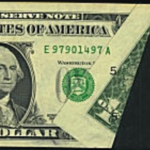 The Olsen specimen, famously known for its appearance in a 1973 episode of Hawaii Five-O, and now graded NGC Proof 64, sold at public auction for $3,737,500 in January of 2010. 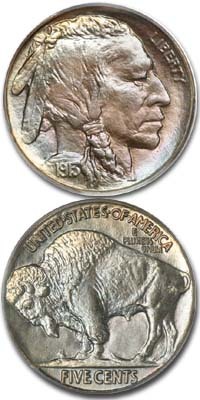 In 1913 the Indian Head or Buffalo nickel as it is commonly called, was introduced. This coin shows a portrait of an Indian facing to the right with the date below and a buffalo on the reverse. The mintmark can be found on the reverse under the words FIVE CENTS. The Buffalo nickel was quite popular, and like earlier nickels, circulated extensively. Many pieces seen today have the dates worn smooth. These are of no value other than five cents, but better condition pieces are worth about 75c each. The most well known and popular rarities in the series are the 1918 over 17-D and the 1937-D three-legged Buffalo. The overdate is worth about $800 while the “three leg” is valued at a minimum of $400. 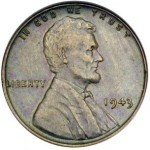 The nickel design used today is the Jefferson type, which was first made in 1938. Quite popular with young collectors, there are no real rarities in the series, but several dates will bring a premium when found in circulation. These are the 1939-D at $3 and the 1950-D at $5. Look for the mintmark on the reverse just to the right of the Jefferson Memorial and from 1968 on the obverse just below the date. On nickels issued during World War II, the mint mark is located on the reverse above the Dome of Monticello.